I had an office in Quepos / Manuel Antonio for almost two years. I would visit at least once a month, usually for a week or so. Sometimes with my missus, often without. I ate everywhere. The worst meal I ever had was at the “Mexican” restaurant downtown. The most reasonable was excellent ceviche at the bus station / market for under three bucks. This posting is devoted to three of my favorite restaurants, and the ones that I visit again and again. One of the most fun nights you can have here, is a visit to “Salsipuedes.” This loosely translates as “get out if you can”. I have to admit that there have been times when we were having so much fun that it was hard to get out! The people responsible for all these good times are the young couple who own and run the place. Mike is Costa Rican, and from this area. His dad had a commercial fishing concession in the area, and Mike grew up around fish. This has served him well in his career as a restaurant owner. His girlfriend and partner is a lovely Argentine gal named Marsala. This is a happy and fun couple. Their personalities and positive attitudes only adds to the welcoming atmosphere. Their English is perfect (Mike went to school in the US), and they are hands on owners. Mike runs the bar, and makes sure that everyone has a good time and meets the other patrons. Marsala runs the dining room, and is usually the first person to greet you when you enter. The setting is unusual. The building was Mike’s childhood home, and it commands a great view of the ocean sunsets. To take full advantage of this fabulous view, Mike removed the entire front wall of the house. The end result is a basically a huge covered deck. This is the perfect setting to enjoy their “tapas”, or what we have been calling “small plates” in the US. This place is a great value. Nothing is over about three or four dollars, and three plates can usually more than satisfy a hungry adult. They make some terrific ceviche, and the tuna can’t be beat. I usually over order, and get first four items on the menu. These are the ceviche, the tuna sashimi with wasabi and ginger, the seared tuna, and the spicy tuna picante. Can you tell I like tuna? 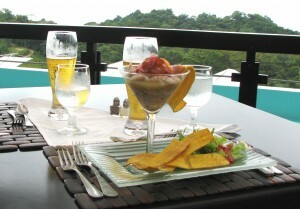 Much more upscale and romantic is the restaurant at Hotel Makanda by the Sea, The Sunspot Grill. This is where I go with my wife for a special meal. It is a little pricey by local standards, but a very good value for tourists seeking great food in a beautiful setting. The dining area is composed of colorful “tents” scattered around one end of the infinity pool. These are actually metal forms stretched with brightly colored fabric. On a recent visit I feasted on a perfectly grilled tuna steak that was literally two inches thick. It was complimented with prosciutto wrapped asparagus and a very interesting fresh salad. Most items here are done on the grill. Since we are on the coast, the menu is dominated by fresh seafood. You will find fresh fish, lobster, huge shrimp, and of course my favorite, tuna! There is also a respectable wine list, featuring a variety of Chiliean and Argentine wines that are popular in Costa Rica. All is served up by a happy, professional staff. Another favorite casual restaurant is at Hotel Plinio. This is an old standard, and I have been coming here since my first visit to Costa Rica twenty years ago. The original owner was a Tico. This was before the big tourism boom. This area was a little plantation backwater, and had a little bit of a wild west atmosphere. The story goes that Plinio did not like tourists very much, and kept a gun behind the bar. He would shoot it into the air when obvious tourists pulled up. It usually did the trick. He sold the bar and hotel to new owners, well before I ever even dreamed of visiting Costa Rica. Hotel Plinio is much more welcoming now. Like so many restaurants here, it is open air. There is a very friendly bar with five or six seats. There really isn’t much of a view. So the owners have planted huge elephant ears, that reach all the way up to the second floor. So the setting here is kind of like eating in a tree house. They offer the most varied menu in the area. Steaks, pasta, seafood, pizza, even Vietnamese dipping rolls! The previous owner was German, as are the current ones. So the kitchen staff can even turn out some pretty delicious German specialties. All of the dishes are well prepared, and the prices are very reasonable. They bake their own bread too. Because of the varied menu, I often recommend Plinio to families. The kids can get a pizza fix, and mom and dad can get some more interesting food. That is not saying that the pizza isn’t good, because it is! There is something here for everyone, and I can honestly say that I have never been served a bad meal. I first visited Costa Rica almost two decades ago. The food choices then seemed to be beans and rice with chicken, rice and beans with beef, or beans and rice with fish. But the restaurant community has matured to the point, that even the most dedicated foodie will find something to love. You will certainly find this to be true in the Quepos / Manuel Antonio area. Buen Provecho!